Sturdy construction, attention to details, and limitless possibilities for imaginative play make the wooden dollhouse a timeless classic. Whether you're looking to be more eco-friendly in your toy choices for your little one, or you're an artist or collector trying to restore a more detailed replica, dollhouses remain one of the perennial favorites among toys. A few decades ago, plastic dollhouses were the epitome of the classic children's toy. They are easy to clean; many have moveable parts such as working doors, or even audio technology so that the doorbell works or the stove sounds like something is cooking when you push a button. However, they lack the classic mystique of a good, old-fashioned dollhouse. Many manufacturers, recognizing a back-to-basics movement, are now making wooden dollhouses for even the youngest set of hands. The Melissa & Doug brand is known for their line of quality wooden toys and puzzles. Their dollhouses are yet another example of solidly constructed toys of exceptional value. Their furnished dollhouse is portable, comes with all the furniture for the house and the pieces are big and chunky. While the house isn't appropriate for children under three, the pieces are bulky enough for small hands. You are probably familiar with KidKraft dollhouses without realizing it. KidKraft is the manufacturer of several different types of dollhouses all of which are made of wood. They are known for their sturdy construction as well as their large scale. 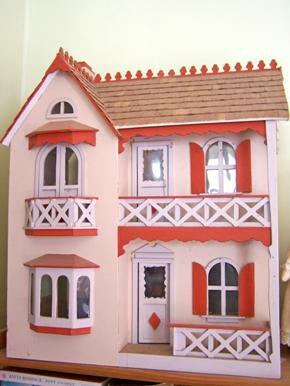 Many of the KidKraft dollhouses on the market are as tall as, if not taller than, a child. You can find KidKraft dollhouses in your local toy store where they sell wooden toys. However, to see their entire product line or buy online, visit their website. Imaginarium is known for their quality wooden toys but what might not be well known is that Imaginarium has core values that the company seeks to promote with each toy they manufacture. In keeping with their core values, their dollhouses are solid and come in a variety of shapes and sizes. Everything is very plain in recognition of two of the company's core values: to promote creativity in play, and to create toys that do not promote sexism. Imaginarium dollhouses can be found at local toy stores and ToysRUs. Just because you have long outgrown playing with dolls, doesn't mean that you have to give up on the dream of having a dollhouse. Whether you buy pre-made from a hobby store or put together your own dollhouse piece by piece, these wooden dollhouses are for the kid inside of you. However, they are not good for the kids around you to play with as they have small pieces, are fragile, and tend to be more expensive. It's not surprising that Melissa & Doug offers dollhouse kits in addition to their line of dollhouses for little ones. Each kit shows an extraordinary attention for fine detail down to the last shingle. The wooden kits are sold online and in some hobby stores. Melissa & Doug offers various styles from the ornate Victorian mansion to the Kotten Kandy Cottage. If you're looking for wooden replicas, dollhouses or historical models, Greenleaf Company Store is the place to look. The company is especially known in the dollhouse hobbyist world as being particularly innovative. They offer laser cut kits as well as half-scale models of some of their most popular houses. Whether you are buying your dollhouse for a little one in your house, or your wooden dream home is for the young at heart but older in body, keeping your dollhouse clean is easier than you might think. Like keeping many things clean, the trick is to maintain the dollhouse for easiest cleaning. Keep your dollhouse in a dry place. Also, make sure that it is not near a window. Too much sunlight will cause the wood on your dollhouse to fade. In more intricate dollhouses, wallpapers, furniture, and paint can fade in the sun too. Many dollhouses that are designed specifically for children can be wiped clean with a damp cloth. A dollhouse for an older child or a teen, that has smaller furniture and finer details, will need to be dusted regularly. Maintaining your dollhouse and taking good care of all the pieces ensures that you will have a precious heirloom to pass down to your children or grandchildren. Unlike plastic dollhouses, these wooden treasures are cherished from generation to generation.